Indeed studying abroad is an expensive affair. 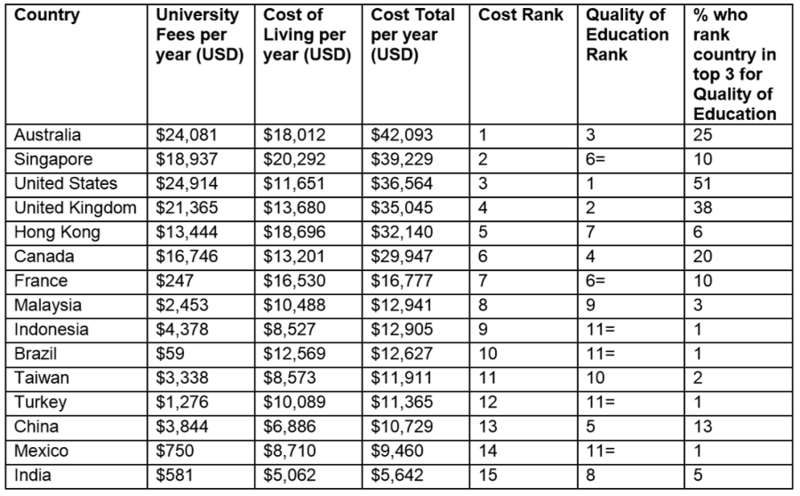 The research report by banking giant HSBC, which surveyed 15 countries, said Australia is the most expensive place for an international student to attend university, ahead of Singapore and the U.S. An overseas student would need US$42,000 (RM134,000 @ 1USD = RM3.2) a year to meet university fees and living costs in Australia. For international students studying in Singapore and U.S., the total cost is USD39,000 (RM125,000) and USD37,000 (RM118,000) per annum respectively. To a family with an average income (middle class) , this is a whooping sum to be forked out for children education if no proper education financial planning is done at a very early stage. It is also true that there are many institutions, colleges, universities and government that offer their students scholarships and financial assistance. It is also a known fact that the scholarships are only for the most exceptional students. The truth is that you must be an all-rounded and an excellent student to win a scholarship. If you able to secured or being offered scholarship or financial assistance to study abroad, then you have removed a huge obstacle and financial burden in your study abroad plan and you can be more focus in your studies and enjoy your memorable years in overseas to pursue your dream. 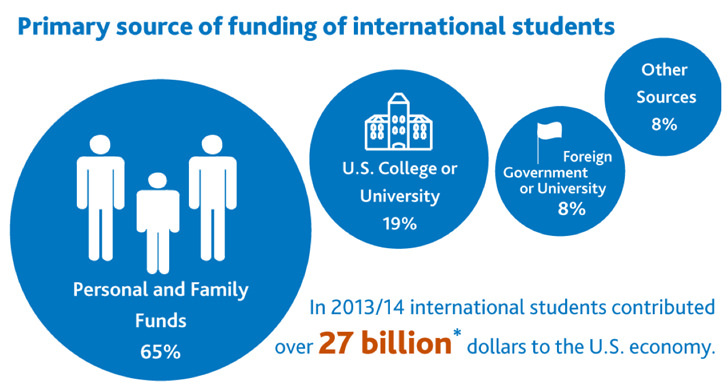 Nevertheless, data released by the Institute of International Education of U.S. revealed that 65% of the international students in the US in 2013/14 were self-funded. Only 8% were supported by foreign scholarships via their own government or corporations and 19% by scholarships from US institutions. In China, the number of self-funded international students in 2012 stood at 299,562 or 91.24% out of 328,330 international students who studied in China. And in Malaysia, the data released by HSBC survey 2014 shown that Malaysian parents drawn its own savings to finance their children education abroad stood at 85%. Based on these data and also the problem of too many students apply for the same thinking will make getting scholarship to study abroad looks dim. Unless you are a bright student, scholarship and financial assistance to study abroad is very competitive and availability is scarce and this make self-funding is the only choice that looks viable. However, do not let this situation dampen your aspiration to study abroad. There are plenty of options available to you. Study abroad can be affordable if you do your home work well. Planning to study internationally requires a holistic analysis of costs and benefits - tuition, lodging, books, food and transportation must be weighed alongside quality of education and liveability. Other than China, there are many countries like Germany, Norway and Finland even offer almost-free tertiary education to specifically target international students. You need to do your home work to identify it. Go on the internet, search, look up and shortlist them. Another way to analysis the cost/benefit is "Value for Money" approach. The new approach is meant to identify and highlight universities that do the best job of helping disadvantaged students graduate with the ability to start a career free of crushing levels of debt with its low tuition fees. The 5 criteria used to identify these universities in U.S. namely tuition fees, percentage of the student body from low-income households, graduation rate, salaries of grads once they start working, and the size of each school’s endowment. 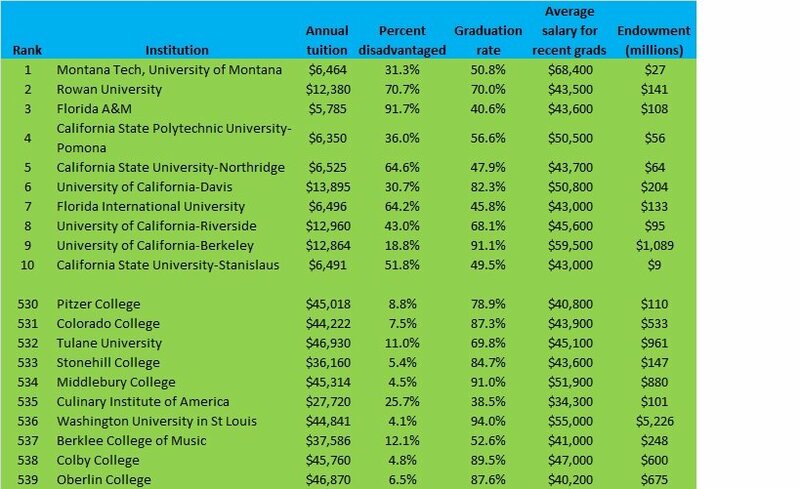 The result is is shocking and a dismay to many reputable universities in U.S. which charged very high tuition fees. In this "Value for Money" approach, it shown that many of these universities offer a low tuition fees but able to help students with low income background to gain quality education and subsequently gainfully employ. Please see below graphic. Low and affordable tuition fees and living cost. High standard of education quality and internationally recognized. Fulfilling wholesome on-campus life with many facilities and student activities. Opportunity to learn additional language skill; the widely spoken international language - Mandarin. Knowing Mandarin for sure will give you added advantage and brighten your job prospect. A new language acquired is equivalent to a lifetime reward. Many Fortune 500 companies have set up regional bases in China and more and more companies are eying China for international trade. As such employment opportunity is promising either in China or your home country. A better understanding of the Chinese culture is now an important employable skill against the background of a globally-competitive workforce. Study in China allows you to gain the skill of understanding of China. Unlike many western countries, universities in China offer almost the same tuition fees to international students as to domestic students, in order to make it more affordable for international students to study at their institutions. Tuition fees in China universities are heavily subsidized by Chinese government. China became the third most popular study destination in the world. China government huge investment in its education system is beginning to position it not only as a major sending country, but also as a destination for study abroad. As such, international students are set to benefit with this huge investment in education alongside with Chinese students. Therefore, if you weigh cost against benefit and plan your study options well, study abroad is within reach to many students even without the assistance of financial aids like scholarship and loan. If you do your research well, you can find a good quality study abroad program at a reasonable cost. Go on the internet, search, look up and shortlist them. Study abroad offers many benefits and will help to realize your own self and potential. Study abroad at a foreign university that offer wholesome campus, colorful and fulfilling campus life, will certainly add value in your quest of acquiring knowledge and skills in your university life. 2. New Study Makes The Link Between Study Abroad and Employability. 3. Student Education Loan- borrow or not? 5. Is The University You Plan to Enroll Offered Wholesome On-Campus Life?